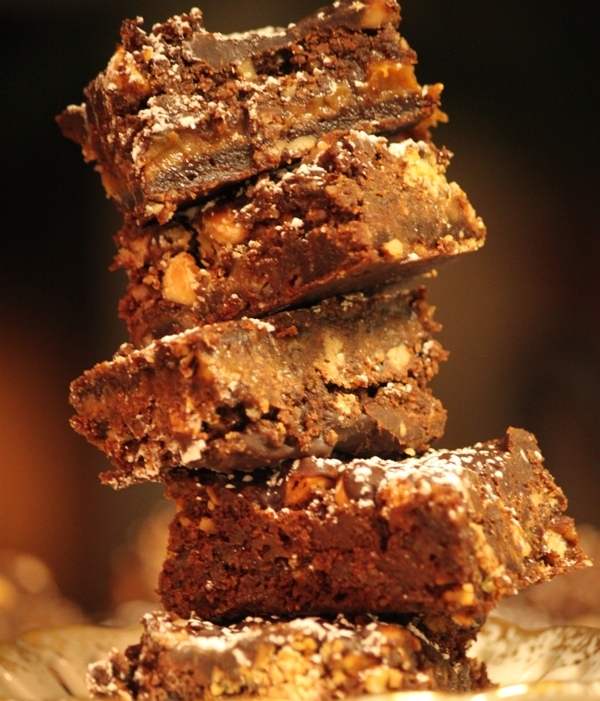 Knock You Naked Brownies | Rosetta Bakes! When I saw this recipe, I knew I had to make it! Chocolate and Caramel together in one brownie had to be delicious! When I took them to work, I was told they were one of the best desserts I’ve made. Well, I wish I could take credit for them, but I have to give credit to The Pioneer Woman. I did make a few changes, but plan on making her recipe as she posted it. I didn’t have German Chocolate Cake mix at the time decided to make them, so I used Duncan Hines Dark Fudge Cake mix instead. I plan to make them with the German Chocolate Cake mix soon, but decided to post the version I made for now. I also did not have caramels (the kind you un-wrap), but I had a few bags of caramel balls, that are un-wrapped, so I used them instead. I don’t think I’ll go back to the wrapped caramels again for making desserts because the balls are un-wrapped, and melt easily. I also sprinkled white chocolate chips on top the caramel in addition to the semi-sweet chocolate chips before putting on the top layer. What ever version you make, I’m sure you’ll be extremely happy with the end results. In a large bowl, mix together cake mix, chopped pecans, 1/3 cup evaporated milk, and melted butter. Stir together until totally combined. Mixture will be very thick. Press half the mixture into a well-greased 9 x 9 inch square baking pan. Bake for 8 to 10 minutes. Remove pan from oven and set aside. In a double boiler (or a heatproof bowl set over a saucepan of boiling water) melt caramels with additional 1/2 cup evaporated milk. When melted and combined, pour over brownie base. Sprinkle chocolate chips and white chocolate chips evenly on top the caramel. Turn out remaining brownie dough on work surface. Use your hands to press it into a large square a little smaller than the pan. Use a spatula to remove it from the surface, then set it on top of the caramel and chocolate chips. Bake for 20 to 25 minutes. Remove from pan and allow to cool to room temperature, then cover and refrigerate for several hours. When ready to serve, generously sift powdered sugar over the surface of the brownies. Cut into either nine or twelve helpings, and carefully remove from the pan.